There are several health and safety issues to be concerned about when working in a warehouse environment. Kee Safety, a leading global supplier of safety solutions, provides a full product range that means whether staff are working internally or externally, at height or on the warehouse floor, they will always have a system in place to separate them from hazards. Boasting such a wide product range, Kee Safety has the ability to solve all a magnitude of challenges that employers and employees face when working in warehouses. The KEE KLAMP range of fittings comprises a comprehensive selection of simple to use, galvanised malleable cast iron fittings. These fittings allow pre-cut lengths of standard tubing to be connected together to form safety guardrails and other types of tubular framework structure. All fittings within the KEE KLAMP range incorporate an integral socket screw which locks the fitting securely onto its tube to give an excellent slip load performance. The extensive range ensures that they can also cope easily with any changes in direction or gradient, and easily accommodate requirements for adapting or extending an existing structure. Finding a compliant, self-closing system that provides staff with a safe access solution. KEE GATE safety gates are particularly suited to provide safe access and egress around machinery and electrical equipment, on access platforms, step overs, stairways and ladders or as part of a demarcated route within a loading bay or warehouse. KEE GATE ensures staff can fulfil their job, follow best practices and comply with current safety standards, without putting their safety at risk. Kee Safety self closing safety gates are spring loaded so can automatically close behind the user, providing an added level of security and overcoming the potential for human error. Having the ability to move goods safely up or down from mezzanines or raised working surfaces. Pallet Gates from Kee Safety have been designed to allow workers to load and unload pallets on mezzanine floors, without the possibility of falling from height. The Pallet Gates range features four different configurations to suit the type of operation required. Gates are available in range of sizes, from 1.4m to 1.9m pallet width and from 1.6m to 2.2m pallet height. They are constructed using KEE KLAMP galvanised or KEE LITE aluminium fittings and tubes and can be linked to new and existing railing systems. Due to the nature of the system, in the event of the pallet gate being damaged from a forklift or general use, the individual fittings can be easily replaced. Gates are supplied part assembled for a quick installation. Requiring a bespoke platform to allow safe access to areas where off the shelf fabricated platforms or other systems such as ladders or towers are not appropriate. Kee Safety Bespoke Access Platforms – which can be designed to suit virtually any requirement – are suitable for difficult to reach areas such as access to machinery, warehouse racking, maintenance of vehicles or trains, welding or plastering. These access platforms are custom built and can be designed up to 3m in height. When higher access is required, the platform is constructed with the addition of an extra support arm. Bespoke Access Platforms are modular in design and utilise either KEE LITE or KEE KLAMP fittings to provide an extremely secure, robust, corrosion resistant access platform. Using off the shelf fittings also allows the platforms to be delivered and constructed quickly and easily, with minimal disruption on-site. Avoiding machinery collisions into walls, corners, racking units, posts and pipes. Kee Safety’s KWIK KIT range of warehouse barriers, which can be used both indoors and outdoors, are made of hot dipped galvanised steel for durability and are also powder coated in RAL 1021 for extra visibility. The range of warehouse protectors has been designed and tested in accordance with the BS EN 15512:2009. The standard states that an upright protector should be positioned at the end of each run of racking between cross-aisles and at uprights, which are positioned at aisle and gangway intersections. The uprights are all a minimum of 400mm tall, and dynamic tests have been conducted to ensure that the minimum energy absorption of 400Nm is achieved. All KWIK KIT barriers are manufactured from size 8 (48.300mm) KEE KLAMP fittings and tubing with a 3.2mm wall. Providing demarcation around plant, equipment and fragile materials. The high visibility, maintenance free KEE MARK demarcation system from Kee Safety is compact, making it portable and easy to assemble. The unique post design with a heavy-duty PVC base weighing 25kg prevents the system from falling during severe weather conditions. Kee Safety’s demarcation system is further enhanced by a high visibility, two colour, polyurethane chain which links between the support posts. Kee Safety offers one of the most extensive safety product ranges on the market. We offer both safety solutions for workplace hazards and safety systems for working at height. Please take a look at how Kee Safety products can help you with your working at height challenges. 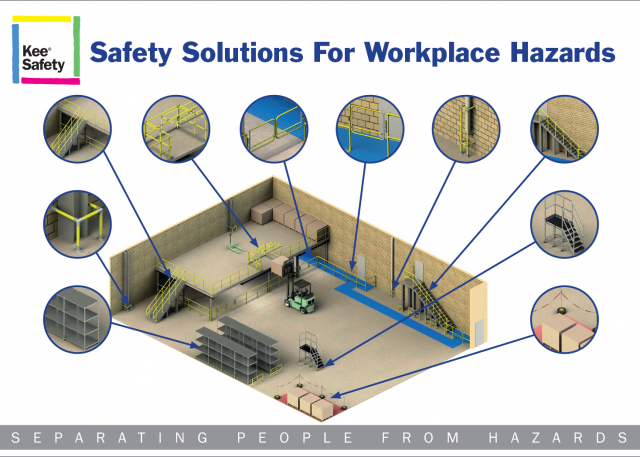 Kee Safety strives to provide solutions to separate people from hazards, so its product portfolio extends wide enough to cover railings, guardrails, barriers, self-closing gates, pallet gates, access platforms and demarcation systems. As well as supporting customers with a large product range, Kee Safety also offers expert advice and technical support, to ensure compliance with all major standards and statutory requirements. Kee Safety products are available in the UK through a well-established network of distributors and fall protection partners spread across the country. Our Export Division works closely with Kee Safety's authorised distributors outside the UK. Our Export Team also has the ability to manage projects directly.